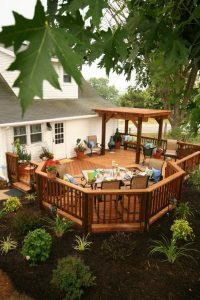 Four Steps to Maintain Your Deck | Wood. It's Real. | Wood. It's Real. …and that requires maintenance. Whether your deck is pressure treated Southern Yellow Pine or another type of material, for a long life, folks must monitor and fix – little by little – any issues that arise. As with anything that is neglected, these outdoor structures can deteriorate and become a safety hazard, but with a little effort, your deck will last for years. In this post, we’re talking about four things you can do to check and maintain your deck. Step 1: Take a walk. 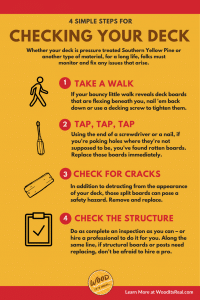 Start your inspection by walking all over your deck – every square inch. Put a bounce in your step. Do the boards feel firm beneath your feet? If so, great! If your bouncy little walk reveals deck boards that are flexing beneath you, check the nails or screws that are holding them. Are they loose? Nail ’em back down or use a decking screw to tighten them. Bouncy boards may also be a sign of another problem: wood rot. It’s a gradual process that starts small and can lead to big trouble. One of the culprits is moisture. As in, rain, snow, ice, and spray from lawn sprinklers. Moisture-driven rot often shows up as dark areas on the wood – but don’t be fooled. Wood that looks good on the surface can have rot underneath. Excessive moisture can also lead to a condition called dry rot. It’s caused by a fungus that loves to chow down on wood cellulose. When dry rot happens, the wood gets brittle and can fall apart. 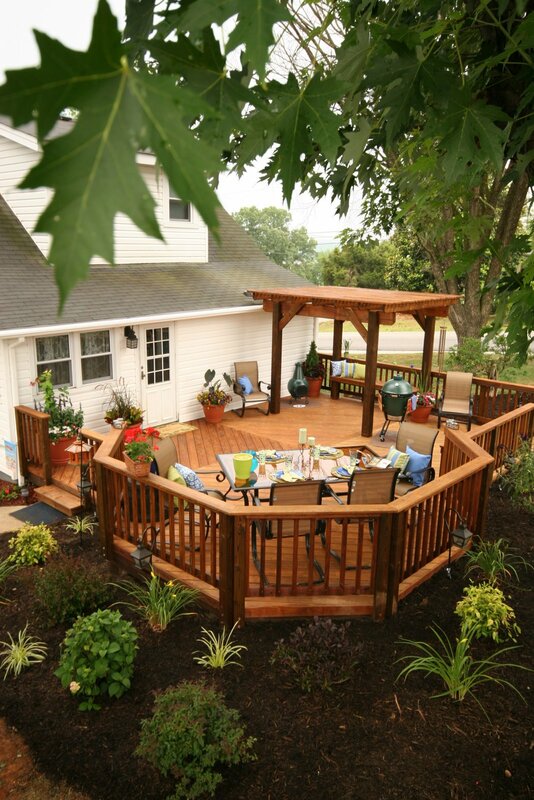 It also attracts wood-eating insects like termites – and you don’t want those beasties partying inside your deck! Step 2: Tap, tap, tap. If you want to detect rot that’s just beginning, put your deck to the tap test. Perform this one by tapping the decking boards with a pointed object like a nail or a Philips screwdriver. You may have seen termite inspection crews doing this. If you’re poking holes where they’re not supposed to be, you’ve found rotten boards. Replaced those boards immediately, so the rot doesn’t spread. Boric acid, or borate, can protect the rest of your deck against a dry rot infestation. Step 3: Check for cracks. In addition to detracting from the appearance of your deck, those split boards can pose a safety hazard. It’s best to remove and replace them. Step 4: Thoroughly check the deck’s structure – joists, ledger board, and posts. 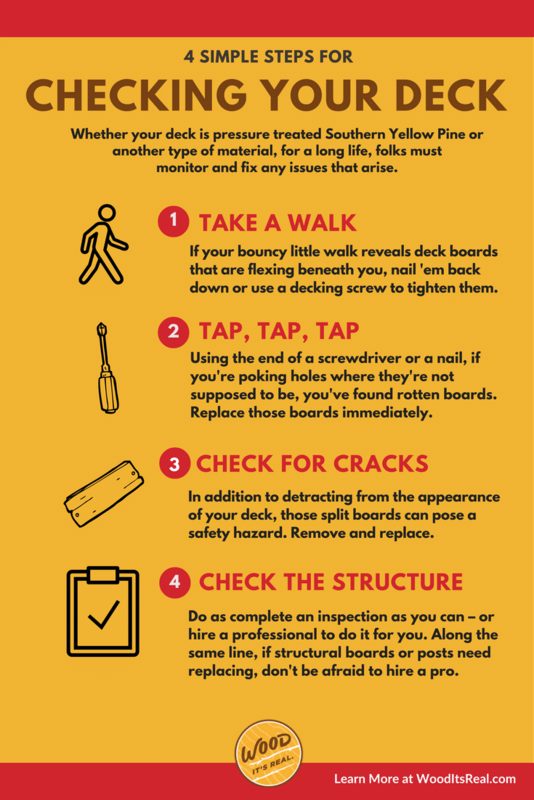 Even if you didn’t find any compromised boards on top of the deck, it’s super important to regularly check and maintain the deck’s structural elements. It might be more challenging to inspect your deck’s frame, depending on its location. Use similar techniques as above (looking and tapping) to check the structure. Replace boards and posts as needed. Do as complete an inspection as you can – or hire a professional to do it for you. Along the same line, if structural boards or posts need replacing, don’t be afraid to hire a pro. Deck structures are serious stuff. 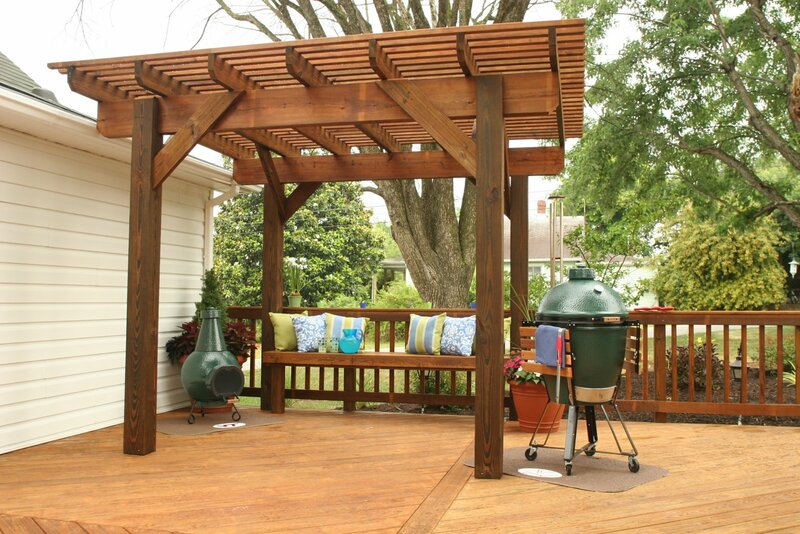 With periodic monitoring – and repairs when necessary – your deck will last a long time. 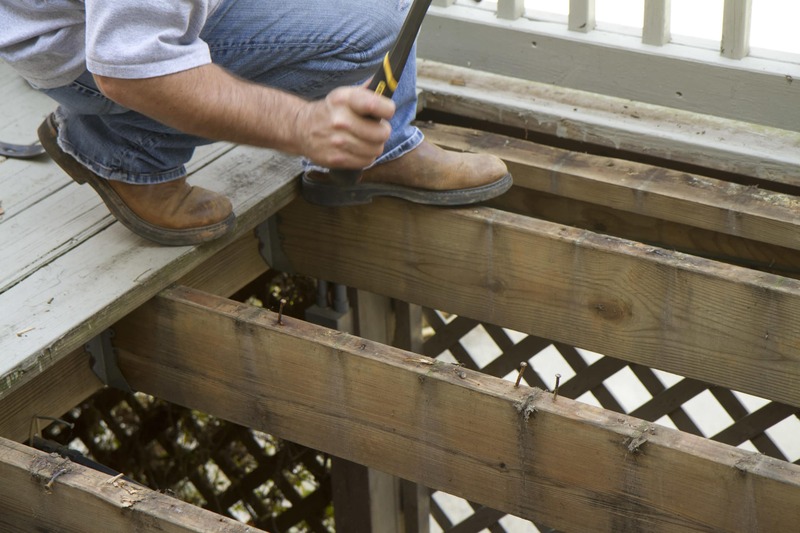 Protect your investment and add regular deck inspections to your home maintenance calendar. Please see this handy post on When to Do What for Deck Maintenance.